Eleven years is a long time in software, so the new version of SampleTank ought to be pretty impressive. IK Multimedia will be well known to many SOS readers. The company make competitively priced hardware add-ons for music production and also have a line of software that includes the popular virtual guitar rig AmpliTube, a number of virtual instruments and the T-Racks range of audio effects/processors. This catalogue includes SampleTank, a sample-based virtual instrument that is 16-part multitimbral, provides support for multi-layer, multi-articulation sampled instruments, can play back both audio and MIDI loops (patterns) and is supplied with a broad palette of sounds that cover all the major instrument groups. The last time SOS looked at SampleTank was quite some time ago when we reviewed SampleTank 2 back in February 2004. If you were a SampleTank fan back then, you’ll have had to wait quite some time for the next major update. A little over 10 years later, SampleTank 3 has now appeared (and, indeed, during the course of writing this review, v3.5 was released, so it’s this incarnation of the software that I’ve looked at here). By modern music technology standards, that’s a pretty lengthy upgrade cycle. So, with v3.5, have IK Multimedia bought SampleTank right up to date so it can slug it out against the obvious sample-based virtual instrument competition? 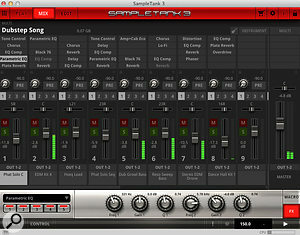 IK Multimedia describe SampleTank 3 as ‘the ultimate sound and groove workstation’. While that’s a pretty bold statement, as with SampleTank 2, it does perhaps hint that this is a virtual instrument that might appeal more to those who want to work with the supplied content (and perhaps tweak it somewhat) rather than someone who wants to build their own sample-based instruments from scratch. This version brings a complete redesign of the user interface. 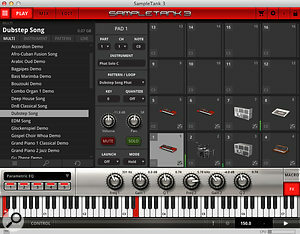 While familiar elements remain (for example, the Parts list within the Play screen, where you can see the instrument loaded into each of SampleTank’s 16 parts), there are now four main workspaces within the overall environment — Play, Mix, Edit and Pad — and each of these is accessed via the four tab buttons located top-left of the main interface. The latest version is a 64-bit only application, and supports the standard plug-in formats for both Windows and OS X, and stand-alone operation. As well as a visual update, the supplied sample library has also been substantially expanded. The 4.5GB library from v2 has been replaced with over 33GB of content including 4000 plus instruments, some 2500 drum and percussion loops and over 2000 MIDI patterns. As before, you also get an impressive collection of audio effects that can be used within SampleTank’s mixer. Many of these are culled from IK Multimedia’s other products such as AmpliTube and T-Racks. The Play page allows you to browse all of this content and assemble a set of instruments within the 16 available slots. On the right you also get a mini-mixer, so you can tweak level and pan without having to flip to the full Mixer page. Each of the 16 parts can contain one instrument and, as well as playing this like a standard MIDI instrument, you can also assign up to 128 MIDI patterns to MIDI notes if you wish. While the obvious thing to do with the Parts would simply be to have them respond to MIDI channels 1 through to 16, because you can adjust the MIDI channel and note range for each part, you can also configure layered sounds or keyboard splits via these options. At the base of the Play page is a virtual keyboard (useful for seeing where MIDI patterns or articulation keyswitches might be for the currently selected Part) and, above this, a strip of controls that can be toggled between Macro view (eight virtual knobs for easy editing of key parameters for the selected Part) and FX view (where you can tweak the effects settings for any of the five insert effects you are allowed for each Part. All of this ‘easy access’ functionality means that you will probably spend a lot of time on the Play page. The Mix page gives you a more detailed take on the virtual mixer for your 16 parts. You can configure up to five inserts per Part and there are four send/return effects available. These have their own mixer channels and can also contain a chain of up to five effects. Used with a suitable audio interface or within a DAW, you can also route each Part to a specific output from SampleTank if you want to add further mixing options elsewhere. 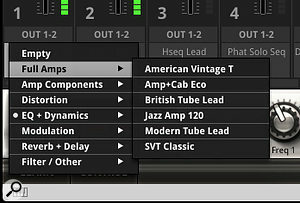 While you can’t get at the raw samples, the Edit page provides plenty of options for customising the sound of an instrument.The Edit page is easy to use and offers plenty of creative options, but what it doesn’t do is allow you to dig into your virtual instrument and start manipulating individual samples or sample layers. It’s perhaps here that it is most clear that the design philosophy of SampleTank is one of playback and detailed tweaking of pre-configured sample-based instruments, rather than an environment designed for those who want to create their own sample-based instruments. Yes, you can load your own samples — via the Import Samples option accessed from the Play page — but if you need to craft your own multi-layered, multi-articulation instruments, then there are better platforms for doing that than SampleTank. It is worth noting, however, that you can easily import instruments from earlier versions of SampleTank; that process is actually rather slick. The final page, Pads, allows you to use SampleTank with a set of drum pad triggers. Obviously, this page will be of most use for triggering loops/patterns or drum sounds. I happened to have an IK Multimedia iRig Pads unit handy, and this achieves a pretty tight integration between the hardware and software, including the ability to browse and select instruments as well as triggering samples. In our v2 review, Sam Inglis was very complimentary about many of the sound groups offered (for example, the drum kits, basses and organs), but less enthusiastic about others (for example, the orchestral samples). With such a significant increase in the size of the library you would hope that is also reflected in some universal improvements in the sounds. I didn’t have access to SampleTank 2 to make a direct comparison but I was generally impressed by the quality and breadth of what v3 offers. There are some very usable drum kits, basses and organs, and, for single-note performances, also some nice acoustic guitars, plenty of very solid synth-based sounds and some useful percussion. I suspect quite a bit of work has gone into the orchestral sounds and, while I wouldn’t put SampleTank at the top of the pile for strings or brass if I was a dedicated orchestral composer, within a mix (as opposed to solo and exposed), there are some very playable instruments here. This includes some decent multi-articulation instruments amongst the orchestral strings, so you can easily use keyswitches to flip between sustained, staccato, pizzicato and tremolo, for example, as required. The range and quality of the effects included within SampleTank are very impressive.If I had to find some words for the overall character of the supplied library of instruments, phrases such as ‘broad palette’, ‘solid and playable’ or ‘caters for almost any music genre’ would just about sum things up. There are some suitably cutting-edge electronic sounds in here (SampleTank can do EDM if you supply the musical inspiration), but there are perhaps other, more specialised virtual instruments that would outperform what’s here in almost all categories. Jack-of-all-trades rather than master of one? Maybe so, but for some users that may be exactly what’s required. The Pads page allows you to configure SampleTank to work with a set of drum pads including IK Multimedia’s own iRig Pads.In discussing the library content, however, I shouldn’t overlook the audio loops and MIDI patterns. These also have plenty to offer and the MIDI patterns in particular can make for some very rapid idea sketching when you are up against a deadline. If you are using SampleTank as a plug-in, these can easily be dragged and dropped into your DAW or sequencer host for further editing and manipulation. Finally, in terms of the overall package, it is also worth saying that the effects options are hugely impressive. You may not get to dig inside the sample-based instruments but, with the combination of the Edit page and the extensive collection of very good audio effects, there is actually a huge amount of creative potential for shaping the sounds. The performance SampleTank 3.5 was, on the whole, very solid, used both as a stand-alone application and as a plug-in within Reaper (I can’t run my usual DAW of choice, Cubase Pro 8, in 64-bit mode on my test machine due to some other plug-in incompatibilities). Indeed, it ran very nicely within Reaper and, given the diverse and very usable sound palette, I could easily find myself turning to it while working on my own musical projects. As a quick source of solid sounds — and with the 16-part multitimbral format — SampleTank 3 is rather good at its job. Finding the sounds you want is simple and, if it is just a case of selecting half a dozen sounds to start composing with, this is about as a easy as it gets. 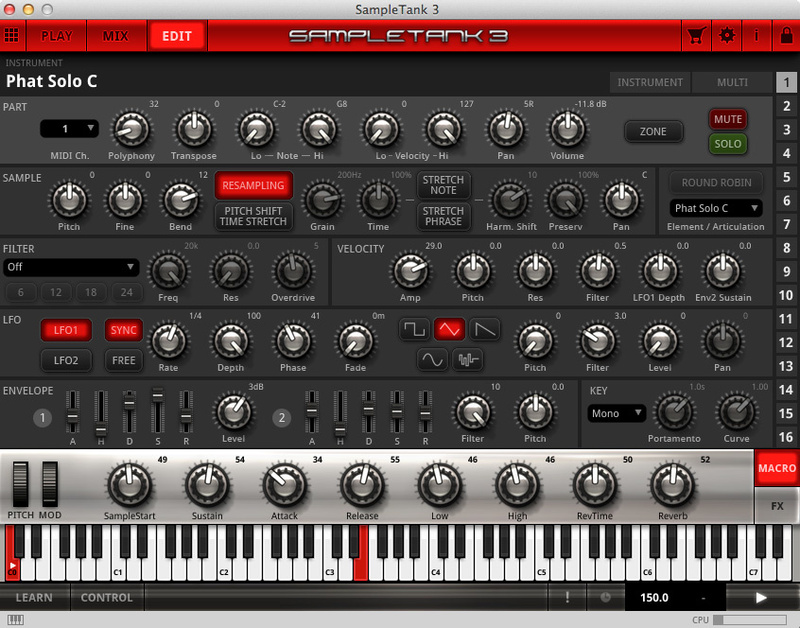 SampleTank 3 is a big step up from the previous version. The redesigned interface is pretty easy to navigate and, within limits (that is, no digging right down into sample-level editing), offers plenty of creative scope with the synth engine editing and audio effects provided. The sounds are generally very good and the palette is broad. 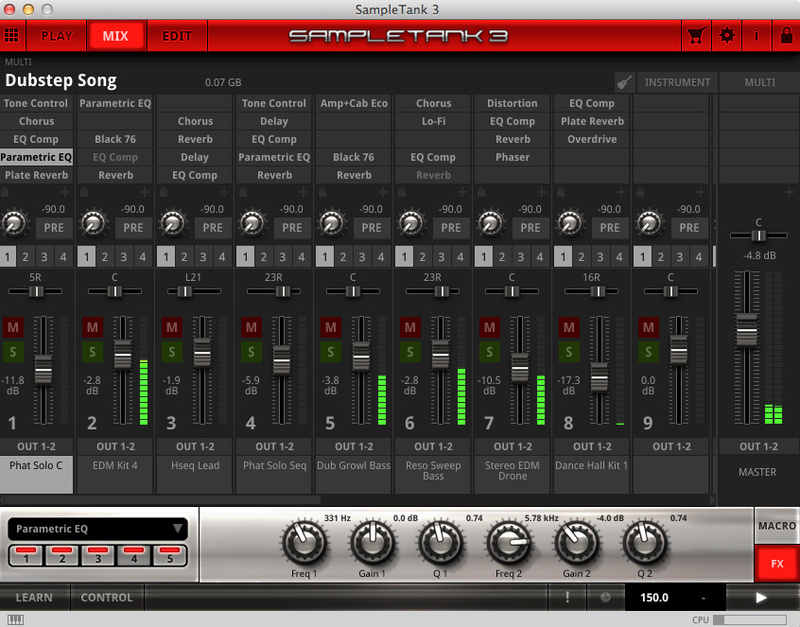 For those requiring a single source of sounds in a convenient format, SampleTank 3 has a lot going for it. It might not be the most powerful or cutting-edge sample-based virtual instrument you could choose, but as a creative workhorse for those that want to focus on playing rather than on hand-crafting sounds, it would be a very solid starting point. 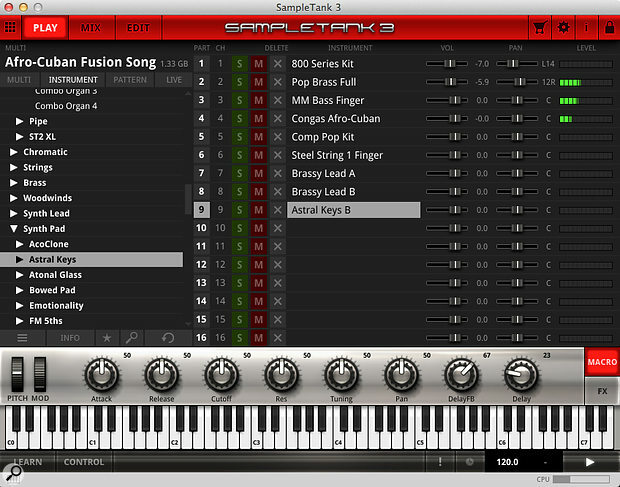 There is a bewildering array of virtual instruments available to the current computer-based musician and, in that regard, SampleTank 3 is up against much stiffer competition than its predecessor back in 2004. 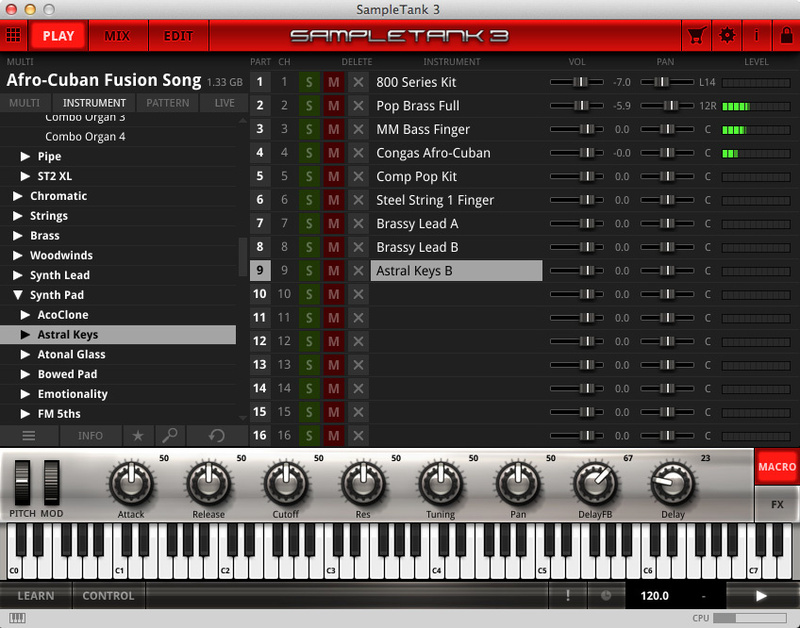 As with v2, however, I don’t think SampleTank is a direct competitor for something like Native Instruments’ Kontakt 5. Kontakt is slightly more expensive, but both applications ship with similarly sized sample libraries. Both can be expanded with additional libraries, and IK Multimedia have a fairly substantial set of sound add-ons available. Recent additions include drum libraries from Billy Cobham and Neil Peart and a range of electronic music production options. Kontakt is perhaps better suited for those who need to dig in right down to the sample level. In contrast, SampleTank is perhaps a somewhat easier beast to master if you are happy to process and tweak a set of preset instruments. Perhaps a more obvious comparison is with some of the virtual instruments bundled with one of the better desktop DAWs. For example, Steinberg’s Cubase includes Halion Sonic SE and Groove Agent 4 SE, and between them they might provide something not a million miles away from SampleTank. Of course, not all DAWs come fully loaded with virtual instruments and SampleTank 3 might be the perfect companion for the computer-based composer looking for a good ‘all rounder’ virtual instrument, particularly if they are working in a number of different genres. Well-designed and easy-to-navigate user interface. Broad palette of usable sounds. Excellent selection of audio effects. MIDI patterns also very good. Instruments can’t be edited at the sample level. Jack-of-all-trades but master of none? Up against plenty of very good competition for your virtual instrument budget. Currently 64-bit only so check your DAW/sequencer for compatibility. 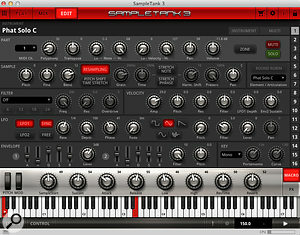 SampleTank 3 is perhaps not the most adventurous of sample-based virtual instruments you could buy but, as a solid compendium of sounds, it is both easy to use and very capable. £299.99, upgrades from £169.99. Prices include VAT. IK Multimedia +1 954 846 9101. Windows 7 or 8/Mac OS 10.7 or higher; 64-bit CPU/OS required. VST 2, VST 3, AAX or AU host. Dual-core CPU, 4GB RAM, 34GB free HD space. Apple iMac with OS 10.9.5, 3.5GHz quad-core i7, 32GB RAM. 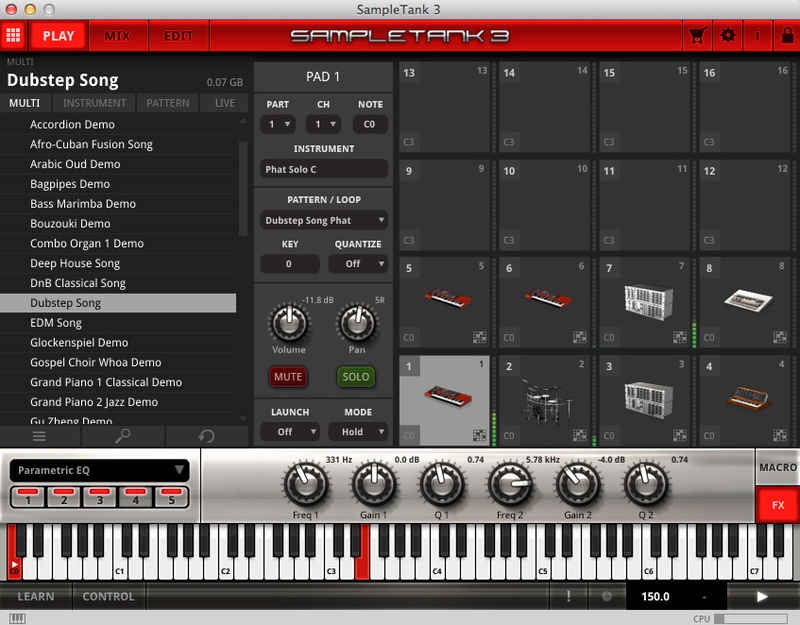 Focusrite Scarlett 8i6, Cubase Pro 8.0.5.